Another proofreading project has been completed, resulting in a new free eBook. Today’s title, How to Stuff Birds and Animals, is part of Frank Tousey’s Ten Cent Hand Book series, a companion to the earlier release, How to Fence. As with its predecessor, it packs an enormous amount of information into its 60-odd pages, intimidating the aspiring taxidermist with a torrent of dense and often disorganized instruction peppered with occasionally disturbing illustrations. 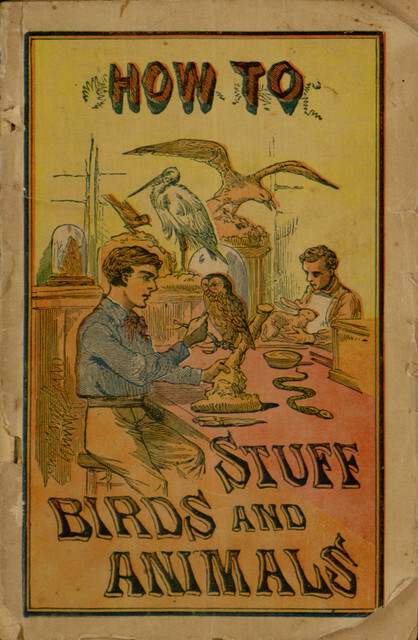 It is unlikely that reading this book is actually going to result in a working knowledge of taxidermy, but it is an interesting glimpse into the popular literature of the very early twentieth century. The book can be viewed online or downloaded in a variety of popular formats from Project Gutenberg.